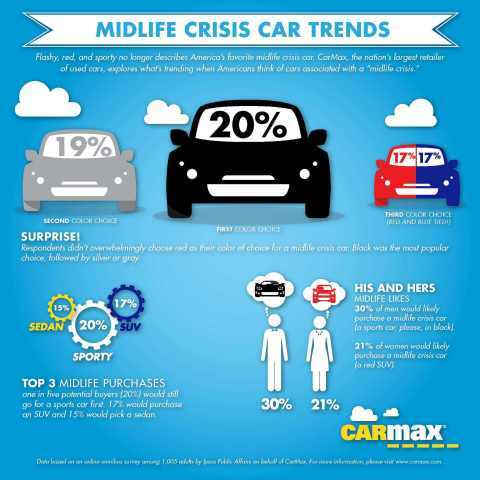 RICHMOND, Va.--(BUSINESS WIRE)--For many, the words “midlife crisis car” immediately bring to mind “flashy, red and sporty.” CarMax, Inc. (NYSE: KMX) today published a survey on midlife crisis car trends, and the results may be surprising: sedans and SUVs are gaining in popularity. While one in five potential buyers (20 percent) would still go for a sports car first, 17 percent would purchase an SUV and 15 percent would pick a sedan. When asked about a specific make and model, the Ford Mustang and Chevrolet Corvette were the favorites. This survey comes at a time when the concept of “midlife” and middle age are evolving in America. Increasingly, this life stage represents an exciting new chapter of possibility and freedom. According to the recent CarMax survey, one in four American adults (25 percent) consider it likely they would buy a car associated with a midlife crisis. No matter what 80s movies told us, today’s midlife crisis car doesn’t have to be red. The most popular color for respondents’ hypothetical midlife crisis car was black (20 percent), with silver/gray (19 percent), blue (17 percent) and, yes, red (17 percent) close behind. Yellow came in at the very bottom of the list with just 2 percent. Thirty percent of men said that they would be very or somewhat likely to buy a car associated with a midlife crisis, while 21 percent of women said the same. But the type of car each gender would buy could not be more different. For men, sports cars still reign supreme, and black is the color of choice, both coming in at 24 percent. Women went with SUVs (19 percent), and red won out as the preferred color (21 percent). According to the survey, residents of the South are most likely to purchase a midlife crisis car, with more than 30 percent of respondents indicating that they were very or somewhat likely to buy one. Midwesterners were the least likely to spring for a midlife crisis car overall, with almost 80 percent of respondents saying that they were not very likely or not at all likely to buy one. Of the 18 percent of Midwesterners who would purchase a midlife crisis car, the most popular make was an SUV – the only region where the sports car did not come out on top. The Ipsos survey was conducted on behalf of CarMax from October 20 to October 21, 2014. For the survey, a national sample of 1,005 adults from Ipsos’ U.S. online panel was interviewed online. For the corresponding infographic, please click here. For the full survey results, email pr@carmax.com. CarMax, a member of the FORTUNE 500 and the S&P 500, and one of the FORTUNE “100 Best Companies to Work For” for 10 consecutive years, is the nation’s largest retailer of used vehicles. Headquartered in Richmond, Virginia, CarMax currently operates 143 superstores in 72 markets. The CarMax consumer offer features low, no-haggle prices, a broad selection of CarMax Quality Certified used vehicles and superior customer service. During the 12 months ending February 28, 2014, the company retailed 526,929 used cars and sold 342,576 wholesale vehicles at our in-store auctions. For more information, access the CarMax website at www.carmax.com.